The Boiled Method: Mix one heaping teaspoon of white flour into one cup of water and stir until there are no lumps. Pour this mixture into a saucepan and heat until boiling. Remove the pan from the heat and allow it to cool slightly before using it. This mixture will start out runny, but will begin to gel as it cools. 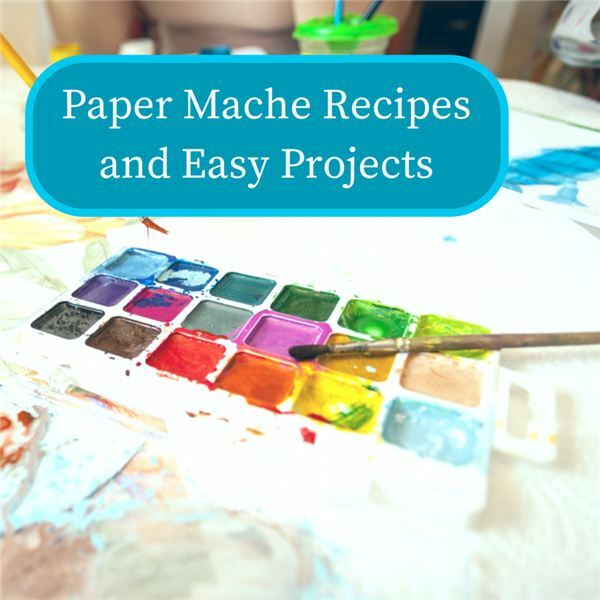 This method of creating paper mache dries clear, so it is preferable if you will not be painting your finished product, or you need the color of the paper you choose to use to show through the mache mixture. The Raw Method: Simpler than boiled, and often a stronger bonding agent, try mixing a raw paper mache. Begin with a small bowl of white flour and a measuring cup full of water. Slowly add the water to the flour, mixing as you pour. When the paste is a consistency that you like, do not add any more water. Experiment with what works best for your particular project. A watery paste may be easier to work with, but you will need more of it to make your project stronger. A thicker paste can be messy, but will bond your project together very easily. Paper Choices: Traditionally, paper mache projects are made with short strips of newspaper. You can experiment with many different kinds of papers for a paper mache project. Try using strips of brown paper bags, colored construction paper strips or even paper towels or tissue paper. These more delicate papers can be used to add interesting details to a paper mache project. Simple Round Sculpture: Blow up several very small balloons (water balloons work well for this). Dip the short newspaper strips into the paste mixture. Holding the balloon on the tied end, place the wet newspaper strips onto the balloon. Continue to do this until the entire balloon is covered, except for the small tied end that you are holding. Before the sculpture is dry, you will be able to use your hands to smooth any wrinkles or correct any imperfections. Allow the sculpture to dry at least overnight. Once the paper mache is dry, use a pin to pop the balloon and gently remove it from the inside of the sculpture. Use fine grit sandpaper to smooth the round sculpture. Paint the sculpture to your liking. Attach fishing line to the sculpture to create a Christmas tree ornament or other hanging decoration. Wire Sculpture: In order to create a more interestingly shaped paper mache sculpture, you may need to create a wire skeleton first. Decide what kind of shape you would like to create and use wire to make your idea come to life. Use the raw method to make paper mache paste, as it is stronger. Dip paper strips in the paste and lay the strips onto the wire sculpture. Remember that you can use your hands to smooth wrinkles and correct imperfections as you go, or wait until the entire sculpture is finished and then go back and fix it before it dries. Also, remember that raw paste is quite strong, and will be able to stand up to gentle sanding once it is completely dry. Your wire sculpture can be painted or stained when it is dry, and will be sturdy enough to be displayed almost anywhere indoors. Experimenting With Color: There are many ways to add color to your paper mache project. You can easily paint your project after it is dry with watercolors, oil-based acrylic paints, or even finger paints. You may even choose to use markers or crayons to decorate a finished paper mache project. Try experimenting with adding color to the paste in order to give your paper mache project a different look. Add a few drops of carpenter’s wood glue to your raw paste recipe. This will give your project a warm honey tone, perfect for creating masks. You can try using powdered pigments, usually used for coloring concrete and available at many hardware stores, or even adding a few drops of food coloring or acrylic paints right into your paste mixture. Maps and Landforms: Add some dimension to your next geography lesson by creating a landform map. Use a large sheet of plywood for a base, and create a few simple wire sculptures for mountains, hills and valleys. Cover the landforms with paper mache and allow to dry. Use acrylic paints to color your landform map accordingly, and label each landform. Get creative and use tissue paper or another delicate paper to add detail to your maps. Easy Math: For younger children, create large paper mache numbers. Use foam or wire to create the numbers and ask children to help you cover the forms with paper mache. Allow the numbers to dry and have children decorate each number however they would like. Use these large numbers for simple math lessons such as addition, subtraction or introduction to ordinal numbers. However you choose to mix your paper mache, and whatever project you choose to explore, have fun! It is one of the most versatile and forgiving craft mediums you can use, and the finished product can be painted, sanded, drilled, sawn and manipulated into almost any shape. Be sure to experiment with different styles and recipes before deciding which one works best for you.